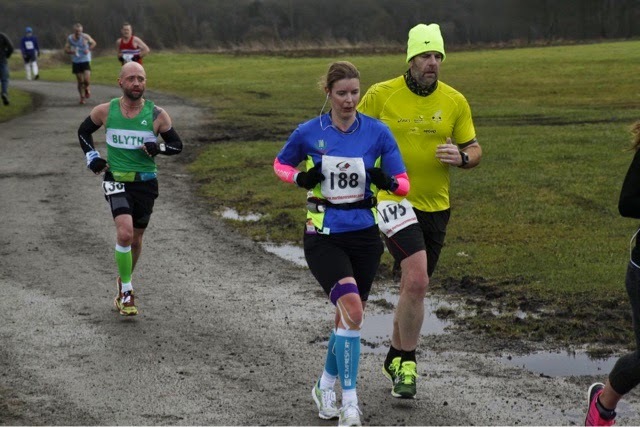 When I entered this is was going to be a key race but following my 24 hour race in November I was unwell then we went on holiday then there was snow/ice so it took a while to get back into proper training again. Since I had only managed a couple of decent hard weeks I didn't really have much to taper from so just had an easier Friday than usual and a rest day Saturday because although I wasn't going for a specific time now I still wanted to have a hard run. I still managed to clock 86miles for the week! After much pondering I decided to wear my Gorun3 which are more usual marathon shoes. 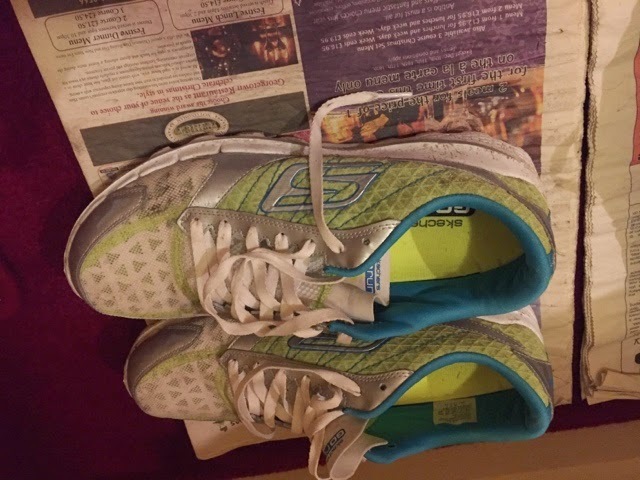 They are very light but I have not worn them for more than a marathon before and as I was going to be a bit slower than normal I was slightly worried they might not offer enough cushion for the duration. 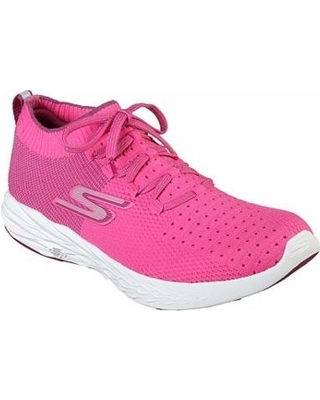 They were great, I love these shoes as they are so light but they feel slipper like and still do have some cushion but the soft type not firm like some lightweight shoes. I was staying overnight with Ian who was marking out the starts (their was half, full and 50km starting in different places) so we were there in good time. I helped with registration and have to apologise to anyone who I didn't understand, I had to ask people to repeat their names several times as the Geordie accent is so hard - I remember it from teaching practice!! I didn't really have any time goals as such, I just wanted to run quite hard but also comfortable and not to fade off too much. I had hoped to be under 4.30 but it was more important to run a well paced race and feel good. 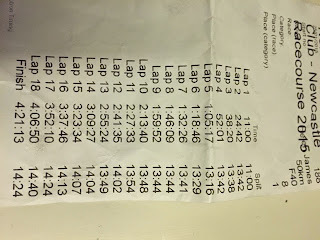 The 50km was 18 full laps and 1 nearly full lap around the race course. It was tarmac with a few uneven bits and some stony bits that I had to be careful on due to not having much cushioning on my shoes but overall it was a good fast route. There were a few inclines and for the first half I was actually thinking there were more downs than ups (obviously this was not the case but it felt that way). Later in the race I did start to notice the ups!! What made this course hard was the wind which picked up a lot in the second half. It was so bad that I couldn't hear the podcasts I was listening to on my shuffle even when they were at full volume. So now to the race. Pretty much from the off I found myself running with Chris, it was nice to have a gossip and put the world to rights! The pace felt fairly comfortable. I wondered if it might be a bit easy as in marathons I cant normally chat that much but I did have another 5miles to do and was not race fit so stuck with it. It was quite a decent pace and one I would have been happy to have stuck with to the end so didn't bother trying to speed up. After about 6 miles Chris wanted to stop for water so I was on my own for a few laps. I noticed the average pace gradually picked up, I think this goes to show you use more energy when chatting as I was still putting in the same effort!! Chris caught up with me a few laps later, we had a few more laps together then I lost him at the water station again. After 14 miles I realised I hadn't had a gel. I had been fed very well on Saturday evening, so well that I struggled to get my porridge down in the morning so I suppose I was well carbed up. Although I didn't feel I needed it I took one anyway - my favourite - shotz vanilla bean with caffeine - as I know I can sometimes go from not at all hungry to starving and need to eat everything I can get my hands on in just a few minutes. 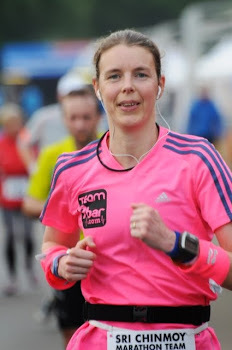 I was running to effort rather than pace although obviously looking at pace because that's what I do. I was gradually getting slower but not drastically. I could have put in more effort to maintain the pace but I was still on schedule for 4.30 so didn't I just kept running at what felt a maintainable effort/pace. From halfway it was getting quieter as the half marathon runners were finishing then the marathon runners but it was never lonely there were still plenty of people out on the course and as it was a short lap there was never anyone far away. Started to feel quite hungry around 22 miles and realised I was due for another gel; this time it was a strawberry and kiwi flavour and was quite nasty - won't be buying those again. Took my 3rd and final gel with 2 laps to go, that was a nice vanilla one. I hadn't been drinking much so had to stop for a walk to take on a couple of full cups of water near the end as I was getting really thirsty - I had been carrying high5 in a waist bottle belt and had spare bottles of high5 but when I get thirsty it has to be water and the only way I can drink from cups is to walk. I wasn't too bothered about losing time though as by now I was well under my 4.30 target but the next milestone up - 4.15 - which had not been on my radar - was too far away so I might as well have a walk to take on water. I was happy to finish in 4.21.13 which was 3rd lady and 1st in my age category. 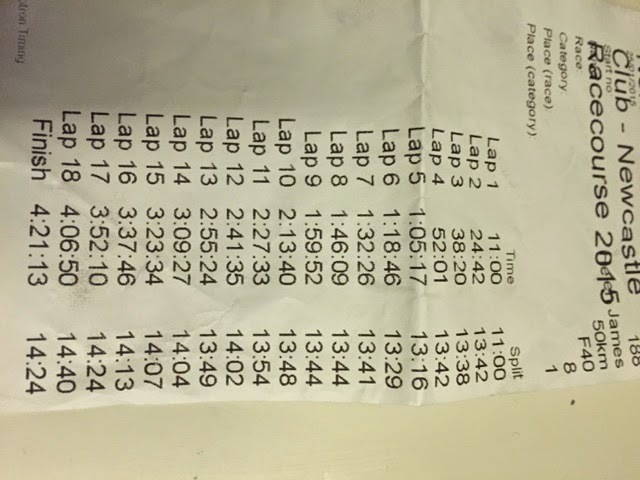 Also, 5th overall in the results but the print out says 8th! In hind sight I probably could have pushed a bit harder in the second half as I wasn't running at full capacity but it is so long since I have raced a marathon and I was not sure what shape I was in so wasn't going to risk it. At least by running within myself my legs were not especially sore the next day so I could train as normal. I have recently started wearing a HRM again since getting a new garmin. I didn't look at it but afterwards could see that I had done a good job of keeping the effort consistent as there was no HR drift - after the first few miles the HR just fluctuated up and down by a few beats rather than a gradual up. If I had tried to maintain my pace then I am sure it would have shot right up! 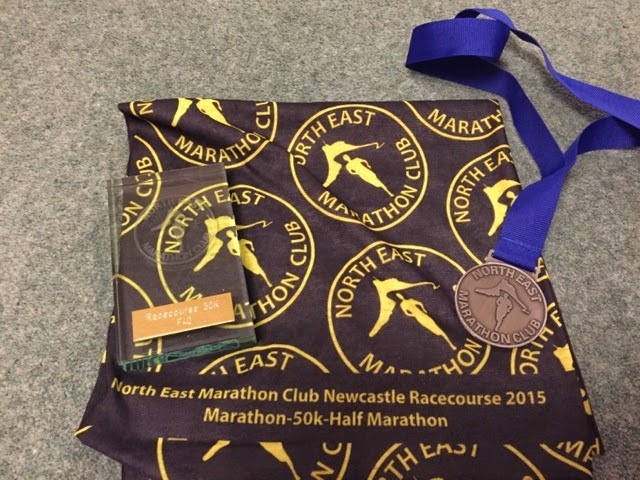 The race was really well organised and very good value, I think it was £24. For that we got chip timing, a medal, buff and sweets at the water station. Once we had finished there was a warm pavilion with help yourself hot drinks, crisps and chocolate.